Researchers at the Center for Correlated Electron Systems, within the Institute for Basic Science (IBS) in South Korea, in collaboration with Sogang University and Seoul National University, reported the first experimental observation of a XY-type antiferromagnetic material, whose magnetic order becomes unstable when it is reduced to one-atom thickness. Published in Nature Communications, these findings are consistent with theoretical predictions dating back to the 1970s. Dimensionality in physics is an important concept that determines the nature of matter. The discovery of graphene opened the doors of the 2-D world: a place where being one-atom or two-atom thick makes a difference. Since then, several scientists became interested in experimenting with 2-D materials, including magnetic materials. Magnetic materials are characterized by their spin behavior. Spins can be aligned parallel or antiparallel to each other, resulting in ferromagnets or antiferromagnets, respectively. Beyond that, all class of materials can, in principle, belong to three different models according to some fundamental understanding of physics: Ising, XY or Heisenberg. The XY model explains the behavior of materials whose spins move only on a plane consisting of the x and y axis. Spin behavior can dramatically change upon slicing down the magnet to its thinnest level, as 2-D materials are more sensitive to temperature fluctuations, which can destroy the pattern of well-aligned spins. Almost 50 years ago, John M. Kosterlitz and David J. Thouless, and Vadim Berezinskii independently, described theoretically that 2-D XY models do not undergo a normal magnetic phase transition at low temperatures, but a very unusual form, later called BKT transition. They realized that quantum fluctuations of individual spins are much more disruptive in the 2-D world than in the 3-D one, which can lead to spins taking a vortex pattern. Kosterlitz and Thouless were awarded the Nobel Prize in Physics in 2016. Over the years, ferromagnetic materials have been widely analysed, but research on antiferromagnetic materials did not progress with the same speed. The reason being that the latter need different experimental techniques. "Despite the interest and theoretical foundations, no one has ever experimented with it. The main reason for this is that it is very difficult to measure in detail the magnetic properties of such a thin antiferromagnetic material," says PARK Je-Geun, leading author of the publication. 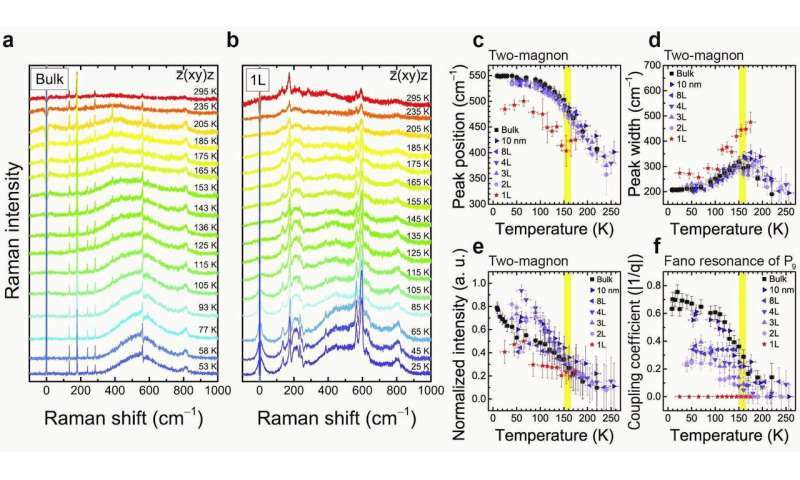 The researchers involved in this study focused on a class of transition metals that are suitable for studying antiferromagnetic ordering in 2-D. Among them, nickel phosphorus trisulfide (NiPS3) corresponds to the of XY-type and is antiferromagnetic at low temperatures. It is also a van der Waals material, characterized by strong intra-layer bonds, and easily-breakable inter-layer connections. As a result, NiPS3 can be prepared in multiple layers, with a technique called chemical vapor deposition, and then exfoliated down to monolayer, allowing one to examine the correlation between magnetic ordering and number of layers. The team analysed and compared NiPS3 in bulk and as monolayer with Raman spectroscopy, a technique that allows to determine number of layers and physical properties. They noticed that their magnetism changed according to the thickness: the spins' ordering is suppressed at the monolayer level. "The interesting thing is the drastic change between the bilayer and the monolayer. At first glance, there may not be a big difference between the two, but the effect of moving from two dimensions to three dimensions causes their physical properties to flip abruptly," explains Park. This is another example of thickness-dependent magnetic materials. Among them, chromium triiodide (CrI3) is ferromagnetic as monolayer, anti-ferromagnetic as bilayer, and back to ferromagnetic as trilayer. And in contrast with iron trithiohypophosphate (FePS3), for which IBS scientists of Prof. Park's group found in 2016 that it keeps its antiferromagnetic ordering intact all the way down to monolayer. The group is also investigating the Heisenberg model, and new phenomena arising from the combination of antiferromagnetic materials with others.